It’s called the Habitat Network, a collaboration between Cornell Lab of Ornithology and the Nature Conservancy, and powered by a powerful mapping program called YardMap. It provides a suite of tools that doesn’t just help the scientists learn more from your inputs, but actually helps you map and then manage your own home landscape ecologically—to be a better habitat-style gardener, if you will. Citizen science is a participatory effort—when non-scientists like myself help collect more observations, or data, from more locations than scientists could without our help. Besides the feel-good part, you get to learn a lot along the way, too. I asked Dr. Rhiannon Crain, the Habitat Network project manager, to nudge us all to try yardmapping. There is no better time than the start of the offseason–when we gardeners should be reassessing and planning for enhancements–to think about how to turn up the volume on diversity in your own garden, which to my mind is the most exciting part of making a garden, anyhow. Read along as you listen to the Oct. 31, 2016 edition of my public-radio show and podcast using the player below. You can subscribe to all future editions on iTunes or Stitcher (and browse my archive of podcasts here). Q. Let’s go back to the start. What in the world germinated an idea like The Habitat Network, and who ever came up with it? But they also wanted to know if they were doing the right thing. They were asking questions like, “Is that correct? Is my feeder in the right location? Do I have the right plants planted?” They wanted answers, and we couldn’t really provide them. There is a lot of anecdotal evidence about what might work in yards, but we don’t have a ton of science about what we call residential ecology. For a long time, some researchers at the Lab were wondering how we could collect really robust data about landscapes, and about what works in these backyards, so that we can answer these questions in a way that we feel really confident about. And it was hard to really figure out a way to do that. Sitting down and just describing your yard, or checking off a box that tell you what’s there isn’t the same as the data you need to answer these questions. As people continue to think about this, Google Maps came online—in 2006, I believe. A. And the world exploded and there were so many possibilities as people suddenly had mapping ability right in their hands, on their home computer. That had never happened before. It’s only 10 years old, but I think it’s hard to imagine a time before Google Maps and the way that people interacted with map data was just so different. You had to be an expert in GIS to do it—and now we don’t. Once that happened we started exploring ways we could use this tool that collects this data. We wrote a couple of grants to NSF, and one got funded in 2009, and I started work in 2010 at the Cornell Lab of Ornithology. We’ve been slowly working toward something really usable for the public since then. Q. When I first used the platform now called Habitat Network, it was a Cornell Lab effort merely called YardMap. You’ve lately partnered with Nature Conservancy to make it even bigger and better. I suppose now that we know how it started, we should help listeners try to visualize what it means to join and use the platform. So I opened an account, and gave my location, and as you just said a Google Maps view of my site was there in front of me, and I made an imaginary fence around it with the tools that you provide me—like a design tool. What do you help me do as a user? A. Once you find that familiar image on Google Maps, you create that fence around your property—sort of defining the space that you’re going to have stewardship over, the space that you want to be talking about, and that you have access to manage. Once you do that, you get to pull open the next step of tool in the toolkit, and those are polygons that you draw over the surface of the map, to indicate the kinds of land types that are there. There are the familiar things, like lawn, and pavement to represent driveways and patios, and buildings—to put on top of your sheds and houses. Once you do that, you answer questions about those, because not everything can be visualized on the map. Sometimes the stuff that matters ecologically is what you’re doing. So for every three land-cover types that you put down, there are questions that you answer about that space. Like how often do you irrigate this? How many native plants are a part of this area? Do you use any chemicals to either supplement the plants or to help keep pests away? Those are all important parts of the project as well. Q. So it’s not all just the actual physical “there’s a tree here; there’s a bird house over there.” It’s also the intentional and practical things that you do or don’t do in those spaces—your management philosophy and methods, that are being “mapped” in a way. If anyone’s worried about hearing words like “polygons” and thinks, “Oh, what does that mean?”—really simply, you make the outline around your property shape, and then within that the tools help you make these other shapes—these polygons. Then there are objects like “here’s a birch tree,” or “here’s an unmown field”—as in mine of little bluestem and goldenrod. As I said in the introduction, many other citizen-science projects ask me to count something like birds, moths—and tell when and where I saw them. This doesn’t really ask me that, but it connected to some of my other efforts. A. Right now we are connected behind the scenes to eBird, a really popular monitoring project for any bird anywhere. [It’s also connected to Project FeederWatch.] That comes in handy for keeping track. We display the birds you’ve seen and reported in eBird, right next to your map. That’s fun for other people, who can peek at somebody else’s map and see what birds Margaret’s seen recently. We hope to start partnering with other people as they build up the tools that allow us to trade data over the internet securely, called APIs. We really hope to bring in data from other popular projects—maybe a butterfly-monitoring project, or a frog-monitoring project. Or perhaps even some tree-stewardship projects that the Nature Conservancy works on, so that you can learn to steward trees right through the Habitat Network. Q. There are other differences from the citizen-science projects where I count birds. What are they? A. We’re interested not just in what is out in nature, but also how you are interacting with nature. This is an under-studied area. It’s really a misnomer to think of ecology as something that’s separate from people, as we increasingly devote more landscapes to human practices. We call them working landscapes in ecology, as opposed to natural landscapes. These working landscapes are really big. We utilize a ton of the land in our country, and we tend to do it in these really tight clusters. So if your wildlife is trying to live, say, along the East Coast, so much of that landscape is people living or working on it. How people interact with that landscape is a subject of science in and of itself. That’s what Habitat Network is trying to capture: that socio-ecological relationship, and how to collect data about it. Q. And you don’t have to be a rural dweller with a large number of acres or even a suburban homeowner with a good-sized plot. You encourage city dwellers to participate. How many maps have been created, and how many acres have been mapped so far? A. Well over 20,000 maps are in the database. It tends to double every 18 months or so—we’ll double the number of participants. It’s adding up to well over 300,000 or maybe approaching 400,000 acres. Q. I recently interview one of your Cornell Lab colleagues who’d used citizen science data to start to really understand bird migration routes better, for instance. What is the potential benefit to scientists, when you real a certain critical mass of inputs from people like myself—what might you get out of it? A. A question we’d love to answer: Across landscapes, does it matter what percentage of the plants are native to whether a nest is successful? Most nesting birds require a pretty steady source of insects to feed their young—there is not a lot of seed feeding of baby birds. Most of them eat caterpillars. Q. I know [laughter]—it’s the mushy baby food thing. A. Totally. That’s a surprising fact to many people, that almost no baby birds eat seeds. The exception to that in North America are goldfinches, and they nest later in the season when the seeds get ripe, so there are some seeds to feed their young. From Doug Tallamy’s work [at the University of Delaware], who sent graduate students out and had the counting the number of species of caterpillars found on plants, there is a strong relationship between that caterpillar diversity and natives. We want to be able to answer questions like: If you put more natives in your yard, does that mean the birds will have an easier time finding caterpillars, and that they’ll have a more successful nest? A. That’s an example of a really interesting question that we’d love to answer. Q. There are applications online, many of them that you pay for, to plot things out in your yard—“design programs,” I guess you’d say, but different from this. And this is free; there is no charge to use your tools. It’s so different and so powerful that I confess I wanted especially to speak to you selfishly, because I wanted to do better at it. It has so many layers and it’s so powerful—and you’ve just added even more of them. For instance, when I made the garden 30 years ago, the intention was for birds, and I think I have done well with that. But with some of the new tools you’ve added recently, I learned there were some things I wasn’t even doing, and it reminded me of things I could bump up the volume on. A. The tool that you’re talking about, the planning tool, is brand, spanking new—just released at the beginning of October. Once you create a map, it runs a bunch of calculations behind the scenes and starts analyzing the map you’ve created, to see what actions you’ve already taken, and what kinds of wildlife those actions are known to support—or we suspect that those actions support. There are a couple of other things in there about green infrastructure, such as how you’re managing water on the site that we calculate actions for as well. You can open up the planning tool and see, “Here are the options that these guys say I’ve already taken.” Those appear as checked-off, and it also gives a list of actions that you might still consider taking on your site in order to further work toward supporting birds, or supporting dragonflies, or amphibians, using the property that you are mapping. You can continue setting those goals for yourself—like planting a new evergreen tree this year, or something with a food source for birds. That’s the level of specificity we’re talking at. Q. There’s a pie chart [below] that tells you what percentage of lawn versus more diverse things you have. 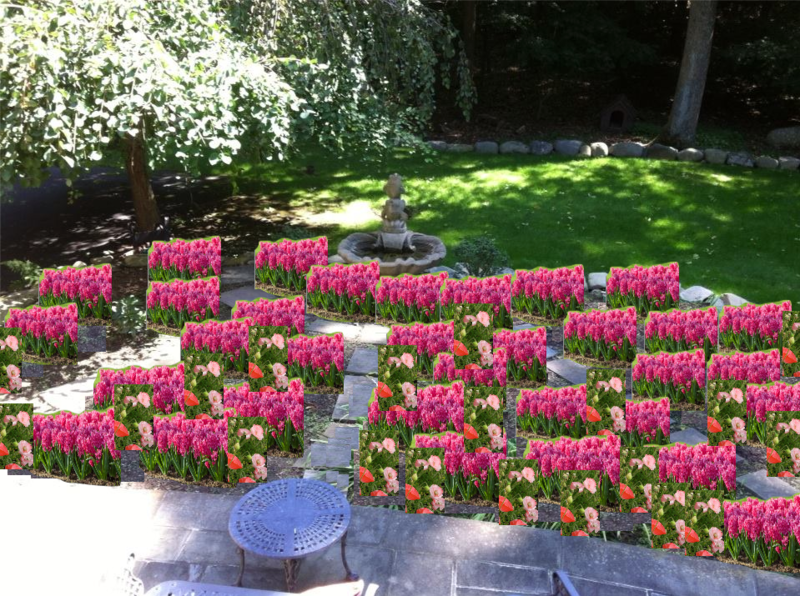 So unlike a straight design program, where you lay down the shapes and say, “I’m going to put the tulips over here and the lilac over there,” and it’s just “the polygons” and nothing more—purely aesthetic. But this makes me go deeper, and I thought I knew my place well. A. The feedback. Think about it: You put so much effort into your garden that you come to think of it one way. I bought my first house a couple of years ago. And I mapped it of course. That would be weird if I hadn’t. A. And I was like, “Look at all this space; I’m going to do gardens.” I put tons of effort into it, planting natives and then the map—just like what you’re talking about—showed that I had a lot of impervious landscape—that big asphalt driveway, and the footprint and the brick patio. 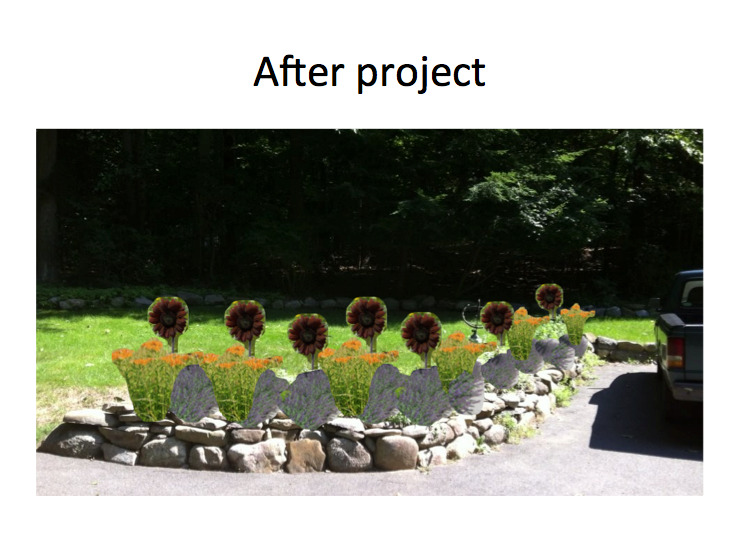 So much of my property wasn’t anything else, and it inspired me to make the decision to put in a pervious driveway. Watching that number change and being able to see it in pie-chart form was an outstanding learning experience. It’s just a different lens for you to look at your yard—a really objective one. Q. It really is. When you’re in it—sitting on your patio, or walking around—it’s experiential, with all the different senses. It’s not analytical; you’re not really assessing or calculating or quantifying. For a lot of people I think what they’ll see is how much turf they have—which is monoculture, not valuable, not diverse, not bird-feeding or insect-feeding habitat. Now that I’ve made lawn sound terrible [laughter]—that was a real condemnation. A. We’re not anti-lawn at all. Q. It serves a great purpose for traffic, to move from place to place, but what you see right away when you map your landscape is how much percentage doesn’t do what you were talking about before—like make baby caterpillars for baby birds to eat. Lawn can’t do that; it has no relationships like that to our native beneficial insects and pollinators. That’s the part that got me excited, and I want to dig deeper into that. I wanted to talk about some of the 20,000-plus maps that have been created. Like there is one family that bought a house in Massachusetts with an in-ground pool, and they filled in the pool and now they have a meadow instead—and they tell their story. A. Absolutely. It’s really important to us to give people the opportunity to see how many people out there are already doing these things. In some ways that’s more important to getting these behaviors to spread throughout communities, than just throwing information at people. So we do our best to tell those stores in the form of featured sites. If you have a great property, we’ll probably hunt you down if you map it and ask you to be a featured site, and you can also nominate yourself—to be an example for people. I imagine there are a lot of who listen to this podcast who are already good at this stuff, and we would love to roll open the welcome mat for them. There are folks out there who are new to gardening, or buying new houses—millennials who are taking that first step, who need models, who need to know what’s worked for people, and be inspired by others who have had great successes. Q. Are people all over the country doing it? A. Yes, all over the country—and Nature Canada is working with us to promote the project up north, so we’re seeing more Canadian sites. It’s open to anyone anywhere in the world. We don’t have the expertise on staff to write content that applies to everywhere in the world yet, so most of the research is North America-focused. You can map anywhere. If you know what you want to plant or just get onto the project, you’re welcome. Q. The Nature Conservancy connection—the new partnership that turned YardMap into the Habitat Network—what are the advantages of that? A. The Nature Conservancy is a great organization. They’re really got their heart in the right place when it comes to conservation and science. They’ve looked to us to help them build out their efforts in urban areas. It’s a new focal point for them. You probably know them as people who work had to preserve wild spaces. Now they’re trying to move into urban spaces, and think about important conservation activity in these more densely populated places, and they’re doing that in partnership with us. So we’ve got focal cities: now Boston and Philadelphia and Washington DC are pilot projects for us, so there is a lot of on-the-ground effort. That’s something that they bring to the table, that the Cornell Lab of Ornithology doesn’t have is this huge network across the country and event he world of people working in particular places on the ground. So we’re marrying up with them to build out our own ability to reach folks across the country. AFTER MY CONVERSATION with Rhiannon Crain, and learning about the new planning tools and other features, I went back to start my YardMap over–so it’s a work in progress. Why not join me and create your own map, too? Guidelines for making a complete map. Want to just learn more about habitat-style gardening? The “Learn” section of the Habitat Network website has articles on everything from creating “snags” (or willdlife trees) from dead or dying trees, to much-loved milkweeds, to the importance of leaving leaf litter to decompose, and more. MY WEEKLY public-radio show, rated a “top-5 garden podcast” by “The Guardian” newspaper in the UK, began its seventh year in March 2016. In 2016, the show won three silver medals for excellence from the Garden Writers Association. It’s produced at Robin Hood Radio, the smallest NPR station in the nation. Listen locally in the Hudson Valley (NY)-Berkshires (MA)-Litchfield Hills (CT) Mondays at 8:30 AM Eastern, rerun at 8:30 Saturdays. Or play the Oct. 31, 2016 show right here. You can subscribe to all future editions on iTunes or Stitcher (and browse my archive of podcasts here). I recently developed a habitat network map of our new house. You really can go crazy with adding objects, but I’ve gotten good results by including only highlights like the compost bin and bird feeders. I have briefly looked into the planning tool, and it’s already got me thinking about adding additional habitat features (bat house?). Also, you can map local parks and nature preserves. How timely! 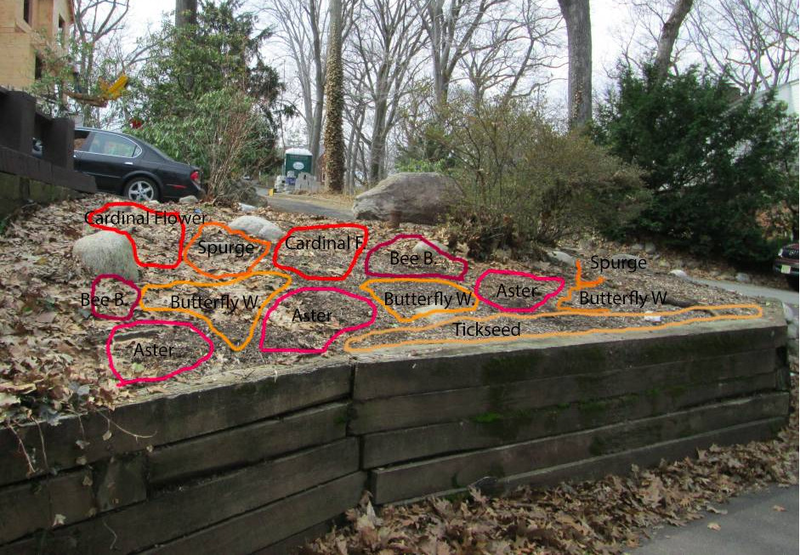 I just discovered this and mapped my yard last week. I ended up going down the planning rabbit hole and feeling vindicated about my decision to let the leaf litter stay every year. Reading about it got me so excited I went right out and started poking around to see what I could find. :D This tool will definitely come into play as I spend the winter planning what changes to make next year. Such a smart idea, drawing in future flowering plants! It’s such a great article about habitat network mapping. The information is very detail and useful. 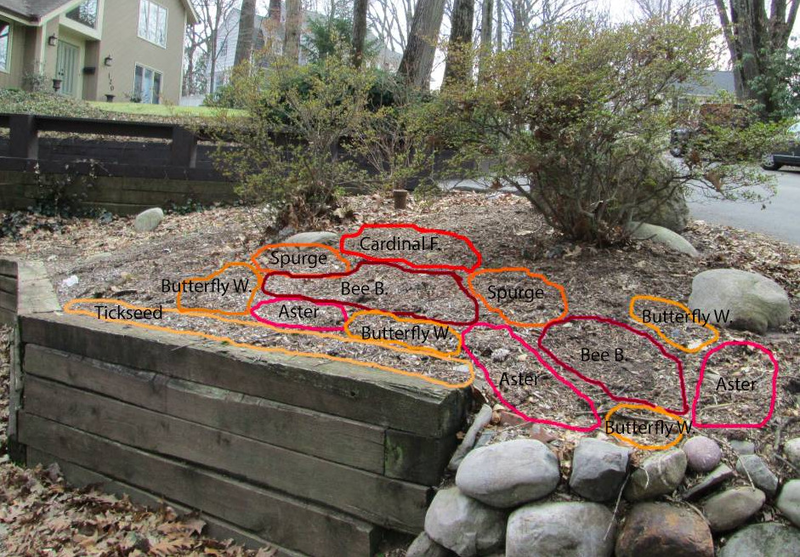 Actually, I am looking for a way to mapping my garden, and your article appeared timely. Thank you so much! it looks like it could be fun, if I could get it to work well. So far, it is buggy, slow and difficult to work. Hi, Cher. Definitely a learning curve; I am starting to get the hang of it gradually, and meantime even when I need to redo something on my map I am learning things by reading all the “Planning Tool” articles and other references. You can also email for help at the address on-site. Another brilliant podcast. I have joined! And have completed a basic map too. It’s so nice to find that something like this works in Southern Europe. I participate in citizen science, uploading data from my weather station every 5 minut e s 24/7. But lots of things, like the BBC Spring watch and Autumn watch only work in the UK and there is nothing comparable in this European backwater, so opportunities to participate are extremely limited. Doing it yourself (DIY), I had already mapped my land, listed trees, natives, insects and wildlife, to understand what I have and to make it better. But that was without being able to have any support, other than my library of books. Now I feel that joining will open opportunities to learn from others and in turn share what I have learned. Change has arrived. We hope it’s not permanent. Thank you for your interest in Habitat Network. This project will permit access to all mapping tools, the forum, photo upload, educational content, etc. until January 31, 2019. After that time, all mapping functionality, the forum, and photo upload will be removed from the site. Habitat Network is undergoing an organizational transition and we do not know when or if the tool will be made publically available again. Educational content will be migrated to other pages at the Cornell Lab of Ornithology in the coming months. We will have all educational information available here until content is transferred. For more answers to your questions, visit our FAQ page. Yes, Terri, I just got an email yesterday (Jan. 11) with the sad news and was waiting to learn more before updating the post. I so loved this project; very sad to hear they don’t have funding to continue the mapping project.